Get up with the get down… and “COME ON DOWN”!!! PART ONE: The GAME SHOW! Following classic Price is Right game play, contestants will play mini games bidding on items donated by amazing Yukon businesses! 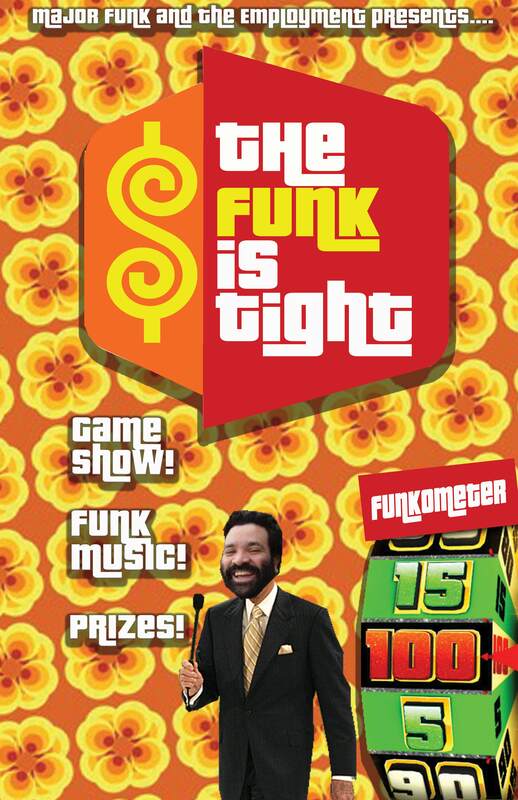 Everyone has a chance to COME ON DOWN and be a contestant on the FUNK is TIGHT. Get your name drawn and you get to place a bid in the first round. Make your way to the end to spin the big wheel to reach the final SHOWCASE SHOWDOWN for your chance to win the MYSTERY GRAND PRIZE. PART TWO: The FUNK SHOW! After the lucky winners are declared, the rest of the evening is a classic Major Funk dance party. Featuring dance performances by Fiona and Jessica, dance the night away whether you won a prize or not- EVERYBODY IS A WINNER AT THE FUNK IS TIGHT! Dawson City- Saturday, Feb 23, Diamond Tooth Gertie’s. Whitehorse- Saturday, March 2nd, Elk’s Lodge.